Highly regarded for more than 100 years, this six-volume set is absolutely full of easy-to-understand, down-to-earth, and spiritually challenging insights on the entire Bible. 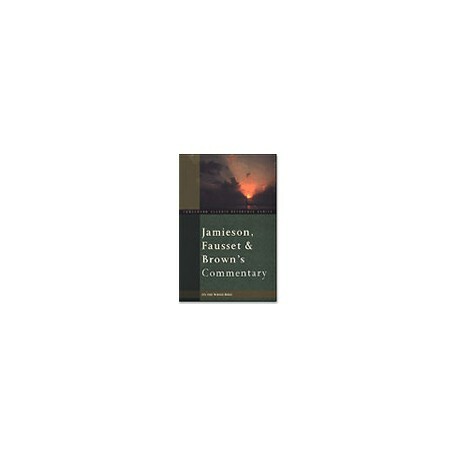 The six-volume Jamieson, Fausset & Brown Commentary has been highly regarded for more than a hundred years. Charles Spurgeon, the famous English expositor of Scripture, is quoted as saying of this commentary, "It contains so great a variety of information that if a man had no other exposition, he would find himself at no great loss if he possessed and used only it." Biblesoft's computer edition of this excellent resource features instant access to the exact place that discusses the Bible verse on which you seek insight, and each entry, written to be easily grasped by wide audiences, is packed with Scripture references, Greek and Hebrew definitions, and the personal touch of its authors. All three of the authors of this commentary were conservative in their theology, and, from first-hand pastoral experience, were familiar with the needs of the everyday believer. All served as pastors in England as well, and this practical ministry experience, combined with their extensive knowledge of the Bible and theological scholarship, is reflected in the easy-to-understand, down-to-earth, and spiritually challenging insights of the Jamieson, Fausset & Brown Commentary.